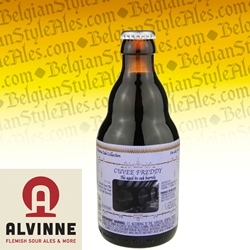 Cuvee Freddy (ABV 8%) from Alvinne Brewery is their Sigma – a dark sour ale with sweet/sour balance -- aged for one year on oak barrels. 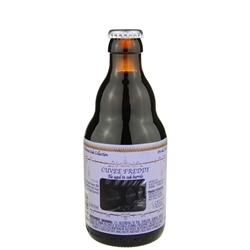 This Flanders Oud Bruin pours a very dark mahogany red, with off white, quickly dissipating foam and aromas of balsamic vinegar, vanilla, tart berries, caramel, and dark chocolate. The taste is bold and full-bodied, with concentrated flavor combining cherry tartness with vanilla, leather, wood, and cocoa notes. In its complexity, balance, and mellowness, it may remind you of a dry, oaky red wine. Ratebeer.com rating: 91 (out of 100) 11.2 oz (capped) bottle. The Alvinne Brewery was begun in 2004 by Davy Spiessens and Glenn Castelein. 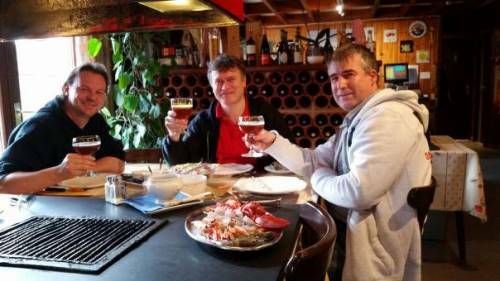 They were joined by Marc DeKeukeleire who brought his own cultivated yeast strain known as Morpheus, which has a very high alcohol tolerance. 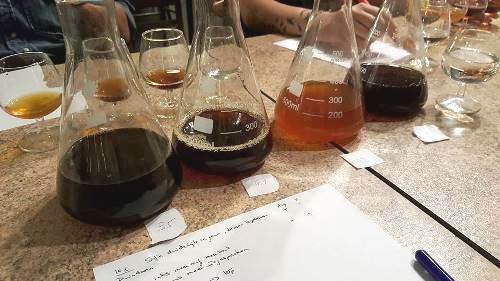 They aim to produce world class, innovative beers of mixed fermentation, making creative use of malt, water, hops, and yeast, and then aging their base beers on used oak barrels and/or with fruits, berries, or flowers.